Air Asia X is probably the world’s first long haul ‘low cost’ airline. In a practical sense it is a development of the charter airlines that for many years have been operating budget flights across the North Atlantic, and in more recent times offering add-ons at a price, typically uprated seating and more ambitious menus. ‘Low cost’ long haul scheduled airlines, at least out of the UK, started with a premium product, and were all financial disasters. Eos, MaxJet and Sliverjet, with L’Avion in Paris rescued by British Airways. They were also stand alone. Whilst in some respects ‘X’ likes to distance itself from Air Asia, it is clearly not stand alone. On the London to Kuala Lumper (KL) service 80% of passengers transfer, mainly to Air Asia flights. They are all ‘self-connecting’ with the exception of the Air Asia X A330 service to Perth (Australia) where through baggage can be checked in. Melbourne is expected to follow. 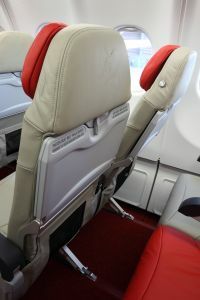 The marketing push for Air Asia in South East Asia helps to promote the ‘X’ services at no cost to the sister airline. Likewise from Europe. The airlines feed each other. 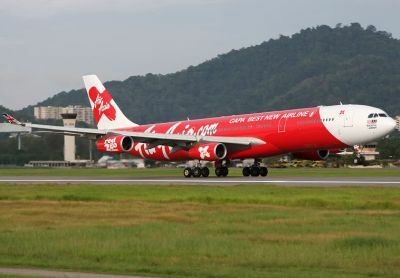 Air Asia X was born in November 2007, essentially as a spin-off from its namesake, a successful regional low cost airline that made its first flight in November 1996. Air Asia is now a listed company on the Kuala Lumpur stock exchange. Air Asia X is 48%-owned by Aero Ventures (a venture of Tony Fernandes and other prominent Malaysians and Air Canada's Robert Milton), followed by 16% Virgin Group and 16% by AirAsia the listed company. Bahrain-based Manara Consortium and Japan-based Orix Corp have taken 20%. What has surprised the carrier’s executives is the amount of transfer traffic at Stansted, said to be around 20%. Passengers have to collect their luggage and then come landside before checking in. Whilst business can be expected from Ireland and Scotland, regular travellers experienced with connecting through Stansted, Northern Europe, Dutch and even German customers are finding the prices more attractive than other gateways and carriers. Whether this will continue, with the British government’s drive to squeeze every penny out of the airline industry remains to be seen. The airline has now completed the refurbishment of its pair of former Air Canada Airbus A340s, at a cost of £2m each and in a novel way. In the centre of the aircraft are 18 Premier Class full flat seats laid out 2+2+2 with universal power points and privacy screen. Branded blankets and pillows are provided, but they are not giveaways although you can purchase them. The cabin has a very nice ambience about it with a mix of red and grey. There is something of a culture shock for passengers used to the Business Class offering of IATA scheduled carriers. You do get a special check-in desk but no Fast Track pass nor lounge pass , although the excellent Servisair offering is close to the gate. Most clients have access but in any event you can pay for services provided. No free alcoholic drinks. The meals are the same as Economy (and first rate judging by the quality served at Stansted at a press reception). 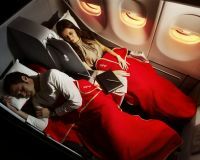 The two servings, westbound the flights can be up to 14 hours, are part of the package. There is a choice of three main courses Asian, international and vegetarian plus a good selection of snacks. You can buy wine and beer very competitively, but that’s it, or a bottle of expensive whisky. If you are that way inclined it’s best to purchase at the Stansted duty free. With the exception of bottled liquor everything on board is priced very keenly in Malaysian Riggitts (MYR). Passengers in the rest of the aircraft pay for soft drinks as well, and everyone is charged for the E-player laptop screen that not only offers a selection of movies and TV, but audio as well. In order to keep the price down the luggage limit is 15kg for everyone. Or you can buy in advance on the web at a discount. It is considered smart to tell one’s friends that you turn left when getting on an aircraft (ie into the premium cabin). With Air Asia X if you turn left you step into a very nice Economy cabin of eight rows, nine abreast. It really does look fine and if the airline decides to charge extra ‘up front’ who can blame them. The seats themselves are to a new lightweight design, do recline and give the feeling of even more than the 32” seat pitch that is offered. 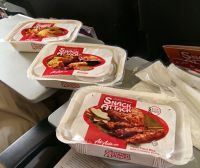 Air Asia X has one big advantage. British Airways does not currently fly between London and Kuala Lumpur and therefore Malaysian Airways has the field to itself. A quick check showed that Air Asia X was cheaper in Economy and about half the price in Business Class. But it does depend when you want to fly and how far ahead you are booking. There is of course competition from the Gulf-based airlines. At the other end passengers use the KL International Airport Low Cost Terminal which has received mixed reviews but does have a proper Premium Lounge, once again available for a fee. However wi-fi comes with the compliments of the airport operator. The bus fare into the city is just £2 by comparison with an astonishing £19.80 single (£28.70 return) on the Stansted Express train to London’s Liverpool Street (the Stansted Slow – it stops at two intermediate stations). The railway web site does not show the off peak fares at all in what appears to be a ruse to overcharge visitors to the UK. First Class the charge is £46 return purchased from a machine, clearly only used by MPs and others on expenses, and by railway staff. Talk of an Air Asia X IPO seems a little premature. According to Chief Executive Azran Osman Rani this will not happen until the end of next year.